The Czech central bank will probably keep borrowing costs unchanged for a second meeting, prolonging a pause in rate hikes to digest signals of a potential economic slowdown in the euro area. As the European Central Bank faces diminishing prospects of raising its own rates this year, its Czech counterpart is trying to augur the disinflationary risks coming from the country’s biggest export market. After an unprecedented series of rate increases last year, policy makers are now more cautious about tightening even as they still advocate raising the benchmark. Economists expect the rate to stay at 1.75 percent Thursday. Economic growth is expected to slow this year, but the central bank sees household consumption staying strong and continuing to create upward pressure on consumer prices. A weaker-than-expected koruna would normally be an argument for raising rates, but it’s now to a large extent outweighed by outside factors, board member Tomas Holub said. News about the cooling German economy, low inflation in the euro zone, and the uncertain outcome of Brexit and trade talks between the U.S. and China are all deepening uncertainty and nudging the central bank toward greater caution with further interest rate increases,” said Helena Horska, chief economist at Raiffeisenbank AS in Prague. Data showed that Czech manufacturing worsened more than expected last month, one of the first signs that a slowdown abroad is spilling into the ex-communist country’s reliance on exports. 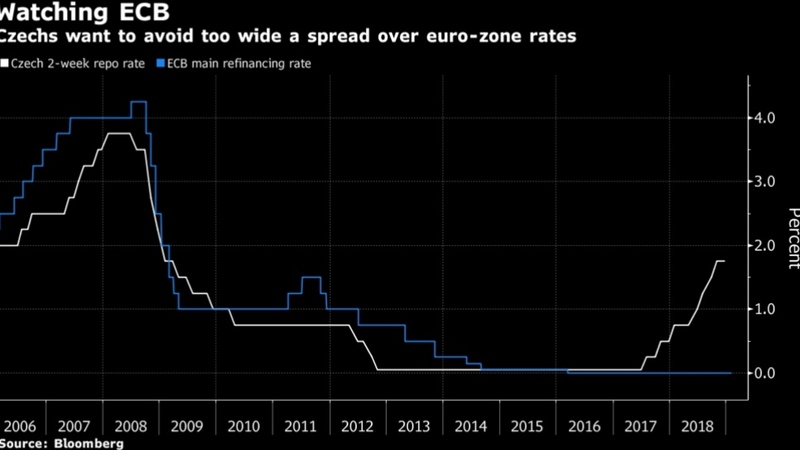 Apart from the impact of weaker euro-area demand, the country’s monetary authority is trying to avoid taking its rates too high above those in the currency zone. The central bank will also publish a quarterly update of its economic forecasts, including an outlook for interest rates and the currency. Derivatives investors have already begun reducing expectations for rates hikes this year. All but two of 20 analysts in a Bloomberg survey predicted no rate move in February, but the outcome of the meeting could still be “a close call,” said Jan Bures, chief economist at the brokerage Patria Finance.